The Koninklijke Marine (Royal Netherlands Navy) including HNLMS JAVA, HNLMS EVERSTEN and HNLMS DE RUYTER arrived in Sydney on 3 October 1930. The ships berthed in West Circular Quay and The Sydney Morning Herald reported on the 'unfamiliar spectacle' of the Dutch squadron arrival. 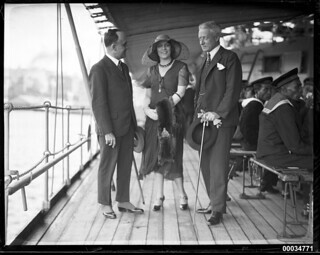 On 10 October, the squadron hosted a reception on board JAVA 'as a return for the hospitality they had received while in Sydney'. The SMH reported that distinguished guests were greeted by the Dutch Consul-General P E Teppema, Madame Teppema and Rear-Admiral Kayser. This image depicts Czech Consul-General Dr Rudolf Kuraz (far left) standing with Hannah and Charles Lloyd Jones, who was the owner of one of Australia's oldest companies - the department store chain, David Jones.